The boss of Volkswagen's US business has admitted the firm was dishonest in using software to rig emissions tests. Michael Horn said the firm was dishonest with US regulators, adding: "We have totally screwed up." Last Friday, the regulators said VW diesel cars had much higher emissions than tests had suggested. French Finance Minister Michel Sapin has called for an EU inquiry, but a UK car industry spokesman said there was "no evidence" of cheating. Mike Hawes, who is chief executive of the UK's Society of Motor Manufacturers and Traders, said the EU operated a "fundamentally different system" from the US, with tests performed in strict conditions and witnessed by a government-appointed independent approval agency. "There is no evidence that manufacturers cheat the cycle," he said. "Vehicles are removed from the production line randomly and must be standard production models, certified by the relevant authority - the UK body being the Vehicle Certification Agency, which is responsible to the Department for Transport." Media captionMichael Horn, president and chief executive of Volkswagen Group of America: "Our company was dishonest... we have totally screwed up"
France's Mr Sapin said inquiries in Europe had to be conducted "at a European level". "We are a European market with European rules," he told Europe 1 radio. "It is these that have to be respected. It is these that have been violated in the United States." Elsewhere, the South Korean government said it would test up to 5,000 Jetta and Golf cars, along with Audi A3s made in 2014 and 2015. Its investigation will be expanded to all German diesel cars if issues are found. VW shares plunged nearly 20% on Monday after the US Environmental Protection Agency (EPA) found that software in several diesel cars could deceive regulators. Volkswagen was ordered to recall half a million cars in the US on Friday. The White House in Washington also reportedly said it was "quite concerned" about VW's conduct. There's one question people keep asking me at the moment. Is this the car industry's version of Libor, the scandal that rocked the financial world? It's way too early to say just yet. But the pressure is now on the car industry to prove that cheating the pollution figures isn't a widespread problem stretching across both sides of the Atlantic. If they dig up more examples, the implications could be huge. Fines running into billions. A complete loss of credibility. And worst of all, the possibility that people have become ill or even died early because of higher emissions. Americans don't tend to buy diesels. They represent just 3% of their car market. But half of all new cars sold in Europe are a diesel. Diesel cars: Is it time to switch to a cleaner fuel? Volkswagen chief executive Martin Winterkorn apologised after the scandal emerged and said he would "support" the German transport ministry's investigation into the carmaker. He has launched an investigation into the software, which allowed VW cars to emit less during tests than they would while driving normally. The EPA found the "defeat device", the device that allowed VW cars to emit less during tests than they would while driving normally, in diesel cars including the Audi A3 and the VW Jetta, Beetle, Golf and Passat models. VW has stopped selling the relevant diesel models in the US, where diesel cars account for about a quarter of its sales. The EPA said that the fine for each vehicle that did not comply with federal clean air rules would be up to $37,500 (£24,000). With 482,000 cars sold since 2008 involved in the allegations, it means the fines could reach $18bn. That would be a considerable amount, even for the company that recently overtook Toyota to be the world's top-selling vehicle maker in the first six months of the year. Its stock market value is about €66bn ($75bn; £48bn). 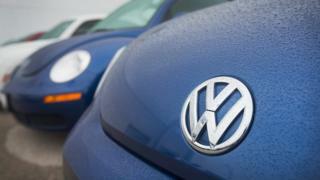 VW has ordered an external investigation, although it has not revealed who will be conducting it. "It's clearly putting German industry under a very bad light," former VW employee Arndt Ellinghorst, now head of global automotive research at Evercore ISI, told BBC News. Mr Ellinghorst explained why it was so difficult to sell diesel cars in the US: "Carmakers have to comply with 31mg NOx (nitrogen oxide) emissions per km. In Europe, that's 80mg, so it's much easier to comply in Europe when you're selling a diesel vehicle compared to the US. "It makes cars far more expensive, because carmakers have to add more technology."